Return to Website > Index > General > Bible Prophecy PreWrath Articles > What About Revelation 6:17? In my last column, I talked about the scriptural definition of God's wrath, identifying it as part of the Day of the Lord, which begins after the opening of the sixth seal. This definition is important because it means that there is no scriptural basis to require believers to be raptured before this point in time. Those who point to the scriptural promise in 1 Thess. 5:9, “We are not destined for wrath,” as requiring the Church to be raptured prior to the beginning of the 70th Week (and therefore, prior to the opening of the first seal) are operating under a mistaken definition of God's wrath. There are those who would argue with this statement, pointing to Revelation 6:17 as proof that God's wrath has begun prior to the opening of the sixth seal. This is because, once the sun turns black, the moon turns to blood, and the stars fall from the sky, the mighty men cry, “Fall on us and hide us from the face of Him who sits on the throne and from the wrath of the Lamb! For the great day of His wrath has come, and who is able to stand?” If the great day of His wrath has come, they argue, God's wrath has already begun. Since this is uttered at the end of the seals, God's wrath must go back to the beginning of these seal judgements, to include seals one through five, as well. Even in the best of scenarios, this is a stretch. A natural reading of the text tells us that, when the mighty men cry, “the great day of God's wrath has come,” they are not referring back to the beginning of the 70th Week. Rather, they are sending up this cry based on what is happening to them at the very moment that Christ appears in the clouds and the rocks start tumbling down upon them — immediately after the opening of the sixth seal. It is the unique set of cosmic disturbances in the sun, moon, and stars, followed by the dramatic appearance of Christ Himself ("hide us from the face of the Lamb! "), that causes them to realize that the end of things is at hand. It is just as Paul predicted they would do in his first epistle to the Thessalonians, where he compares them to those who sleep and are drunk at night. In addition to the natural reading of the text, there are many additional reasons that this verse refers to a future (albeit imminent) outpouring of wrath. They are covered in detail in the fourth chapter of my book, Before God's Wrath, so I will not go into them here. The "Great Day of God's Wrath"
Rather than using reasoning to prove that God's wrath is imminent but in the future, as part of the Day of the Lord, which begins with the seventh seal, it would be nice if we could find direct, incontrovertible scriptural evidence that this is so. Indeed, we have such proof. Notice that the mighty men cry, “the great day of God's wrath has come.” They do not say, “God's wrath has come.” They mention God's wrath only as part of a larger construction, the great day of God's wrath. Does this larger construction have a clear identification as a prophesied event? If so, can we identify when this event will occur? Absolutely — the great day of God's wrath is a synonym for the Day of the Lord. The Day of the Lord is a specific time period extensively documented in both the Old and New Testaments. It was identified by Old Testament Jews as the day when the Messiah would come and set everything right. Israel's enemies would be destroyed, the people of Israel would be delivered, and the Messiah would usher in everlasting peace. For God's enemies — and, therefore, Israel's enemies — it would be a terrifying time, one when God's righteous anger would be poured out upon the wicked and unbelieving. Zephaniah identifies this as “a day of wrath” (Zeph. 1:15) and Isaiah calls it “the day of His fierce anger” (Isaiah 6:13). Peter, Paul, and Luke also refer to it several times in their letters. Now, in Rev. 6:17, John records the mighty men of the earth crying, “the great day of His wrath has come!” Could the “great day of His wrath” be a synonym for the Day of the Lord? It seems most likely. The Day of the Lord has many synonyms, each using “the Day of...”construction. This includes the Day of Jesus Christ, the Day of His Wrath, and the Day of His Fierce Anger, among others. The Great Day of His Wrath is one of them. Keep in mind that the relationship between the Great Day of God's Wrath, or the Day of the Lord, and this unique combination of cosmic disturbances seems foreign only in our modern culture. It certainly was no mystery to John's readers. The first century Jews were intimately familiar with the Old Testament scriptures. They had been looking for the Messiah for generations. 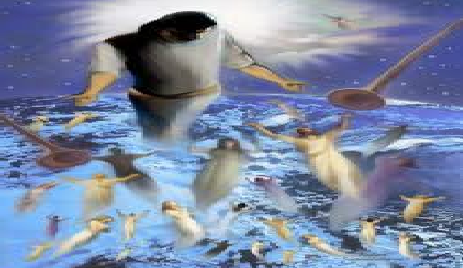 When the sixth seal is broken, it isn't simply the ensuing calamity that causes the men in John's vision to cry, “the great day of God's wrath has come!” It is the specific combination of the sun turning dark, the moon turning to blood, and the stars falling from the sky, which they recognize as the signs given to us by the Old Testament prophets as the beginning of the Day of the Lord (Joel 2:31, Isaiah 13:10, Ezekiel 32:7). It is only in our culture, two thousand years later, that we have lost a sense of the significance of this specific combination of cosmic events. That this is followed by the appearance of Christ Himself (Rev. 6:16) make this evidence incontrovertible. Thus, the reference to God's wrath is relevant only as part of the larger event of the Day of the Lord, which encompasses many other events, including the sealing of the 144,000, the trumpet judgments, the bowl judgments, the final acceptance of Jesus the Messiah by the believing remnant of Israel, the judgment of the nations, and the crowning of the Messiah as King of kings and Lord of lords. The outpouring of God's wrath is only one of these many events, and all scriptural indications are that it does not commerce right away. A loose example might be awaiting a fierce battle as part of a war. The battle itself does not begin once war is declared. The declaration of war simply paves the way for troops to be readied, battle plans to be drawn, and battles to be executed. Like the other events of the Day of the Lord, God's wrath happens in its proper succession, as part of God's perfect timing. “Then one of the four living creatures gave to the seven angels seven golden bowls full of the wrath of God who lives forever and ever. The temple was filled with smoke from the glory of God and from His power, and no one was able to enter the temple till the seven plagues of the seven angels were completed. Then I heard a loud voice from the temple saying to the seven angels, `Go and pour out the bowls of the wrath of God on the earth...”(Rev. 15:6-16:1). Only now, as the 70th Week draws to a close, has God's wrath begun.